This tour started off badly and only continued from there. We arrived to the meeting spot ten minutes early to make sure we were in the right spot. We found some other travelers who would be on our tour so knew we were where we should be. 20 minutes later, the tour guide finally showed up but never introduced herself, apologized for being late, etc. My husband just noticed that a woman with a clipboard was talking to some of the people we had met so went and checked us in. She never actually greeted me or the rest of the people in our family and only barked at my husband that she needed the rest of the people to come get a sticker I don't even think made eye contact with me, just checked my name off a list as she handed me my tour sticker. Then when it was time to go, she just took off towards the transfer boat, never made any announcement or explained how things would go and I think just expected everyone to follow her. The actual boat ride over to Delos was uneventful. When we arrived to the island, she got our tickets and led us the museum where we met the guide who took us around the site. The tour group was large, around 30 people, and much too large in my opinion to hear our guide unless we stayed very close to him which was difficult to do given the size of our group. It was also a very windy day so very difficult to hear much of anything unless we were literally standing right next to him. The information provided was interesting- at least what I was able to hear. I happened to see many other tour groups, many that had the audio headsets. This is a much preferred way to have a guided tour around Delos or perhaps a private tour. Our tour was just too big, and we couldn't hear half of what the guide said. My other big disappointment with this tour was the guide lost a member of our group midway through the tour- he told her to meet at the bottom when she asked where to go when in fact we all met at the top. She waited around for the group to join us, only for our tour group to move on to another part of the site. The woman who officially ran the tour day the woman we met in the am prior to the boat ride could have done a much better job of keeping the group together and make sure we didnt lose anyone. She mainly was just walking around, taking pictures and seemed more interested in her own experience instead of ensuring the enjoyment of the people who had paid for the tour. Also reiterates the point that the tour group was just too large. If they are losing people midway, there are too many people. Lastly, they said the transfer boat back to Mykonos would leave at 130 and to make sure we were back on the boat by 125. We wound up jogging to make sure we got on the boat in time and had no time to tour the site on our own. 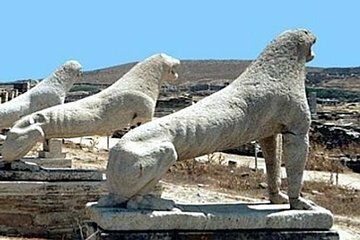 Overall I would say Delos is worth a visit but do NOT use this tour company. Use one that does smaller groups and uses the audio headsets. We booked this tour through Viator and the check-in started out bad. When I asked our tour guide Alexia Why 28 people in our group? She replied: Oh, that's not our maximum number at all. It'll be fine. It was not! We did not have any audio we were in Europe for 5 weeks, taking other tours with audio and speakers and her English accent and vocabulary were not the best. She may have been well informed but we couldn't hear her. What a waste of our time and money! The only benefit was our personal time in the museum where we could read/study everything on our own. We've used Viator a lot in the past with good results. It's unfortunate that they could not make good on this situation. Our booking stated pick up would be at 9:15am. Our hotel rang at 8:50am saying our transfer was here. We then had to rush, worried people were waiting for us. We apologised and explained it should be 9:15am, driver said they had called the hotel to say the transfer would be earlier this was never passed onto us if it was true. At the meeting point, we waited 20 mins to be joined by others in the group and 2 guides then walked 5-10 minutes to the old port not new port as stated. We then had to wait whilst the woman went to buy the boat tickets which confused us as we had pre booked the tour so why were we waiting around for someone to buy our tickets?! She returned and said the boat was running late, it shouldve been there for 10am but it wasnt, meaning we waited a further 20 mins. We finally then boarded the boat however the boat wasnt a small wooden boat as described - it was a large white tourist boat. Also there were so many people on the boat - people who had booked on the day too so it was full of random tours. We were told our return boat was at 1.30pm but we had to be on the boat for no later than 1.20pm. On arrival at Delos we had to wait AGAIN whilst they went to buy our entrance tickets. Once through we waited yet again for our guide. After being at Delos for 25 mins the guide finally arrived. She apologised and said it was busy - this isnt my problem - we had pre-booked this trip in the hope it would be less hassle and more structured. The tour then started 3.5 hours after we were picked up. The guide was knowledgable but she did repeat herself. She walked too quick in thenheat which was hard work. There was 30 of us in our group which is a lot for 1 guide to control and speak to. Sometimes if we stopped on a walkway it was difficult to hear her as other tours were going past and their guides were taking too. The tour with the guide lasted around 75mins but we didnt really get to see much of the island in that time. We were then given free time until our return boat. We went to see the lion structures but they were very disappointing as they are frankly falling apart considering they are replicas. By the time we saw the lions and went to the cafe to grab a cold drink it was time to walk back to the boat meaning we had no time to visit the museum on site which I would have loved to do. We got to the boat for 1.20pm - our guides were nowhere to be seen so we just boarded. Inside was completely full meaning we had to sit on the top deck in the blazing heat. The return journey was extremely choppy and uncomfortable. On return to Mykonos port, I have never seen anything like it. The term squashed like sardines springs to mind. As we were trying to exit our boat and the port - other people were on the port trying to board other boats, some with suitcases. This caused absolute chaos and frankly was a health and safety hazard. How nobody fell in the water or was injured is beyond me. People were walking along the port breaker wall which is very unsafe and tourists should never need to take such drastic action to get to dry land. Absolutely ridiculous! We finally made it out and found our guide. We walked back to the first meeting point and got back in our minibus. By this point, I was so tired and hot, I just wanted to get back to our hotel and be in the aircon! We got on the minibus and on the way to dropping off another group, our driver reserved into a rock. She was very nervous and a panicky driver. Clearly driving in Mykonos is not for everyone but as she is driving paying tourists she should at least be confident and be able to get everyone to and from safely! As we approached the turning for our resort the driver asked us if she could drop us off on the main road. She said it was hard to drive up and tun around in our resort. This was ridiculous - minibuses get up that drive with ease - I felt it was just a lame excuse. By this point I was furious the day itself had been a shambles, totally unorganised and running late constantly and she now couldnt be bothered to take us back to our hotel after we paid an extra 32.60 for the transfer! I told her I was very hot and asked if she could take us to reception. She sighed but drove on however literally to the end of the main driveway and told us she wouldnt go any further yet she did that morning so we had to get out and walk up a steep bank to where our hotel actually was at least 100m away. We then called into reception to ask them about the confusion over our pick up time. The manager informed us they never received a call from the company changing our pick up time! Overall the tour itself was ok but everything else was chaotic, late and overpriced. It seemed to be more of a money making exercise. I dont understand why we were passed between so many different guides - 4 in total! From pick up time it was over 3 hours before we even started the tour let alone got to Delos. Definitely not worth the money or the stress! Our tour guide was very informative. The only thing I would improve is clarity in regards to morning meeting point. There were places where it said the meeting point was old port and others where it said the meeting point was new port. We sent an email through Viator and were able to obtain a clear answer within 24 hours. DO NOT BOOK THIS TOUR!!! This is a transfer company, not the actual tour agency! They will only pick you up and book the tour in your name! You can get the real tour, for 50 euros, at the old port! The guy that picked me up was totally clueless, didnt even knew how to redeem the voucher he had for me. 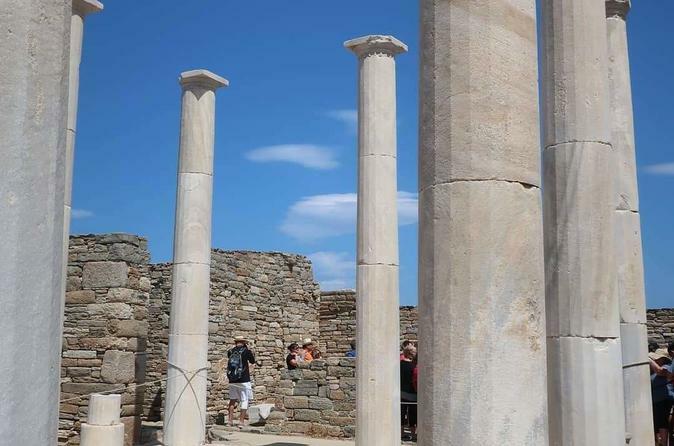 The tour of Delos was great, nice place, nice guide, but either book another tour here or do it directly at the port! Good tour but very hot and tour guide didn't know when to stop talking. Very good tour, we did not get the wooden boat transfer but rather the large boat runs from old port few times a day. We ended up in a small group of 6 and our guide was knowledgeable. I love our guide. She did not sugar coat things and was up front to everyone. Very knowledgeable archeologists. I forgot her name now but she was great short black hair . Also please make sure you wear a hat and sun screen. Very sunning and hot. Oh and also take water with you. Theres only a little caffè on the small island and you wont go there until after the tour is done.kds loved !! Amazing to be at a place what used to be the manhattan of today. This was a great tour...just be sure to bring a hat because it is sunny and hot. This was such a gem of a tour. Right from the start - the hotel pick ups/drop offs to the tour itself - it was so well organized and we had an excellent guide who narrated some of the stories, history and significance of the ancient ruins at Delos. The place itself is easily the best preserved ruins we saw throughout Greece and has such an aura as you see the place come in sight as we approached the shores on the boat. The boat ride was great - it takes about 30-40 minutes and the only downside was the overcrowded boat - we had like 10-11 different tour groups of 10-20 people each onboard and this huge number was evident even at Delos as we walked around the site.